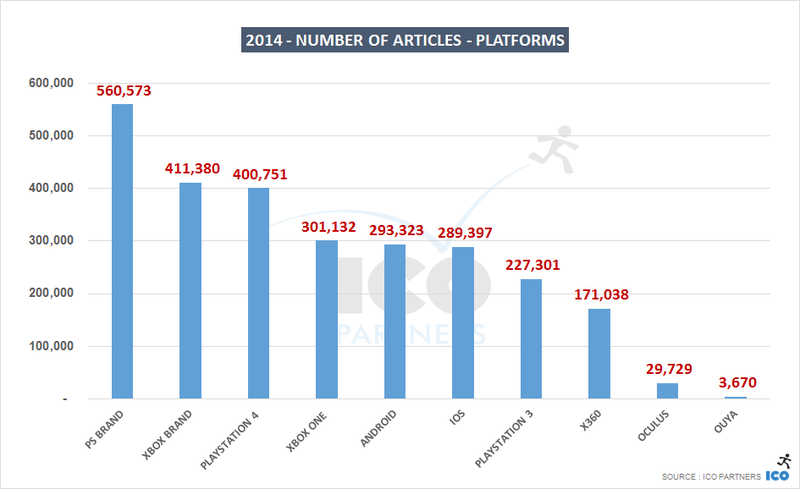 New data has been published by Thomas Bidaux of ICO Partners, showing which games and platforms garnered the most headlines in 2014 and revealing who had the ear of online press. The figures were generated by ICO Partners internal tracking software, which monitors around 3,500 websites in 28 languages. Bidaux admits that his "Media Monitor" tool isn't foolproof, but he does believe it gives an accurate picture of the wider media perspective. What it tells us about 2014 may surprise you. Firstly, let's have a look at how the year panned out for coverage on a platform-by-platform basis. At this point, Bidaux asks us to bear two facts in mind: firstly, that the publications he monitors are skewed quite heavily towards specialist outlets covering gaming. Some tech and mainstream outlets are included, but the core-heavy focus may have an effect on the level of iOS and Android coverage. Secondly, that Nintendo's platforms were not monitored year round, so any comparative data would be unfair. Therefore, they have been left out of the platform analysis. It's no surprise then, that PlayStation and Xbox are the clear leaders, although the gap between the two may be bigger than expected. In fact, PlayStation as a brand took over a third more in online column inches over the course of the year, with PS4 alone almost equalling the exposure of the Xbox brand as a whole. Perhaps even more surprising is, according to Thomas, both iOS and Android were roughly equal, not just with each other, but also with the reach of the Xbox One. Breaking the battle of PlayStation and Xbox down over the year, Bidaux finds that, whilst the Xbox may have been closing the gap on the sales front, it was losing considerable ground in the media. In fact, his numbers indicate that the two brands started 2014 on equal footing, but PlayStation drew away consistently over the next 12 months, finishing the year with almost twice as many articles in December as Xbox. Bidaux puts responsibility for that gulf in holiday coverage largely at the feet of the PlayStation Experience so heavily promoted by Sony. 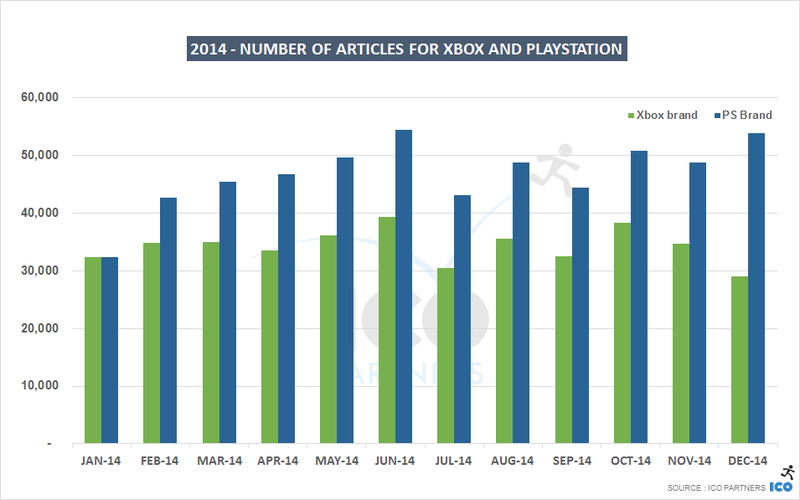 Perhaps even more interesting is the chart showing the media coverage of individual games. Here, there is some obvious weighting towards games which have come out earliest in the year, but it's still something of a surprise to see EA's Titanfall at the top of the table, outweighing Minecraft and Destiny in second and third place. "Genre-wise, there are five shooters in the top ten, and three open world games," Bidaux explains. "Those categories of AAA games are clearly dominant (in volume at least) in their media presence. "Minecraft is its own thing. I think the price tag that Microsoft paid to buy Mojang can be explained by how much of a cultural phenomenon and a cultural item Minecraft has become. While it got a lot mentions during the acquisition, it has to be noted that Minecraft is almost always in the top 15 of the most mentioned games in a month. The regularity of its media presence explains more about its presence as the 2nd most mentioned game in the media than anything else. "Lastly, it is fantastic to see Smash Bros get in that top ten. This is a game that only exists on two consoles. And the Wii U is far from being a dominating player in its generation (and the 3DS is not getting headlines like it used to). It is also with a release date late during the year. I guess the audience demand for that particular game lead for a lot of media coverage." 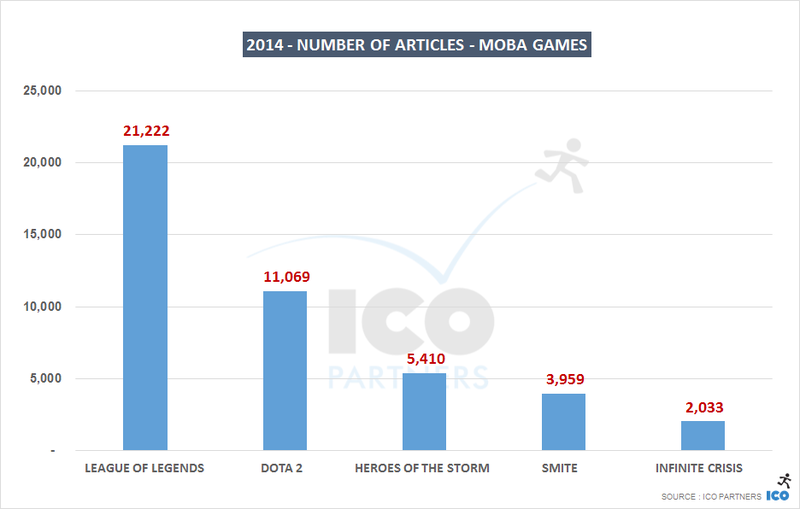 ICO Partners also drilled a little more deeply into the numbers on MOBA and MMO coverage. 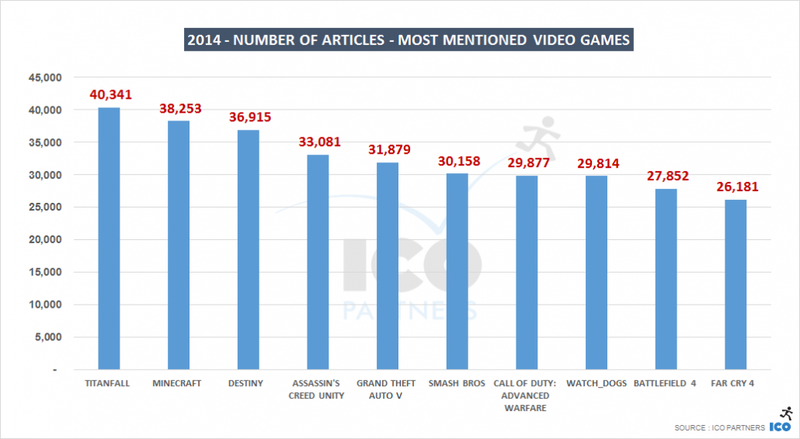 The most prominent members of each of these categories are unlikely to surprise anybody, but what is noteworthy is that the two top games, League of Legends and World of Warcraft, attracted similar levels of press attention. 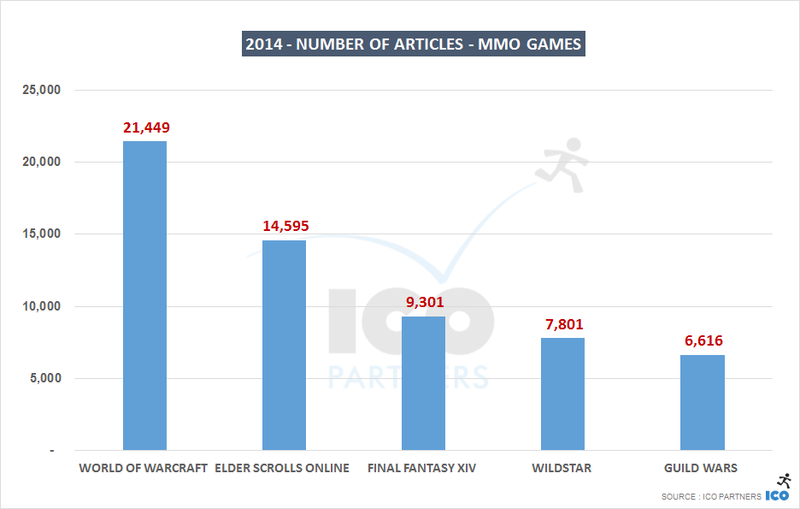 "It is actually difficult to draw many conclusions from just these data sets - but it seems like it is difficult to pre-pitch a new MOBA game and it is difficult to get an old MMO in the news. This media behaviour matches the way the games work in many ways: It is difficult to evaluate the impact a MOBA will have before it is out in the wild and an MMO has a lot of content to pitch before its launch. So much content, that whatever is released afterwards is difficult to get media to care about."